What are Motor Control Centres? The terms ‘Switchgear’ and ‘Motor Control Centres’ are used in general to describe combinations of enclosures, busbars, circuit breakers, power contactors, power fuses, protective relays, controls and indicating devices.Read more about switchgear here What is Switchgear? | Features, Components and ClassificationThe standards used in Europe often refer to IEC60050 for … [Read more...] about What are Motor Control Centres? How Star Delta Starter Works? Star-Delta starting is frequently referred to as “Soft-starting” a motor. But what is soft about his starting method? Why is it used? What are the advantages? What are the disadvantages?Let’s first analyse what Star Delta starting is! 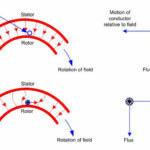 It will be explained by using an example motor.What is Star Delta starting?Star Delta starting is when the motor is connected (normally … [Read more...] about How Star Delta Starter Works?